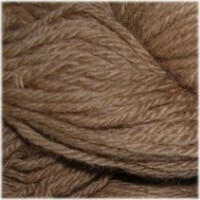 Luxury and refined: Baby Camel Aran is a pure and undyed yarn spun from camel inner hair. It is velvety and incredibly soft. Camel fiber has unique characteristics of superb warmth, softness, and strength. Yarn spun from camelhair is one of the fines and humanely harvested animal fibers in the world - it is not sheared, but combed or collected from the ground.